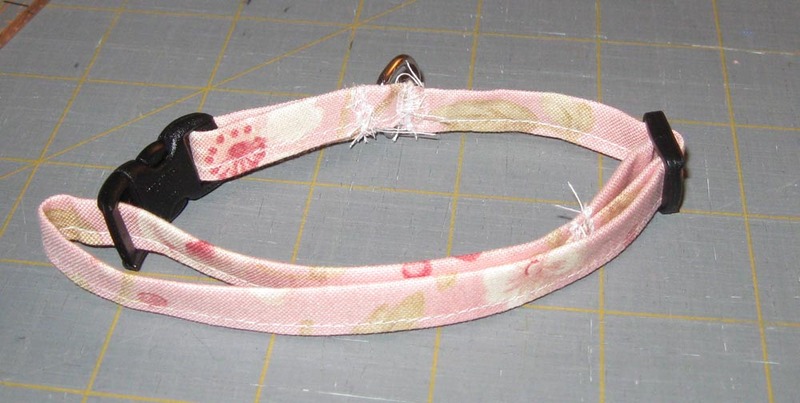 I spent some time today working on a new pretty pink collar for our smallest yorkie to keep my mind occupied. I used a scrap piece of a honey bun strip that started out about 16". 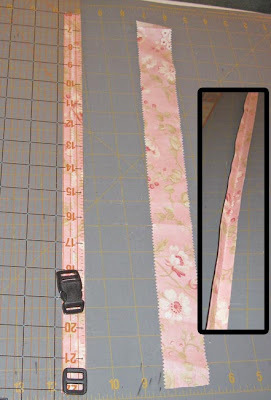 I used my folding pen (still love this item) and folded the sides in on the strip and then folded the strip in half (image inset) and sew the strip closed. Then I got her original collar and used it as an example to figure out where all the pieces go. I didn't do very well with sewing the the pieces together. There were some tight spaces. Maybe because I had the wrong foot on the sewing machine. I never changed my walking foot. At first glance of the collar photo, it looks great. But, when you look closer, you see it's not as it seems. It's not put together very well. Strings are everywhere and not so sure about it's strength and durability. If anyone has any hints as to how you sew tiny strips together without making a mess, please pass them along.